You know what makes me feel old? When movies from my childhood get remade. You know what makes me feeler even older? When movies from my twenties get remade. 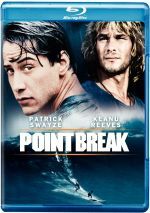 Today�s Confrontation with My Impending Mortality comes to us via 2015�s Point Break, a remake of the 1991 Kathryn Bigelow film. After the death of his pal Jeff (Max Thieriot), extreme athlete/adrenaline junkie John �Johnny Utah� Brigham (Luke Bracey) goes straight and becomes an FBI agent. Utah learns about a group of thieves who do the Robin Hood thing: during exotic stunts, they steal valuables and donate them to the needy. They also do this as part of the �Ozaki 8�, a series of extreme sport stunts that seems to be unachievable. Utah realizes that they�ve gotten through three of the eight, and that activity four will require surfing. When he attempts to take on a massive wave, Utah meets �eco-warrior� Bodhi (Edgar Ramirez), the man who turns out to lead the gang of thieves. Utah infiltrates the group and works on the case while he deals with potential challenges to his loyalty. No one ever confused the 1991 Point Break for a great movie, but it offered silly fun. The film never took itself especially seriously and it benefited from that attitude, as it delivered enough action and thrills to entertain. By contrast, the 2015 Break comes with much bigger delusions of grandeur. I won�t say it packs itself with pretensions, but with its emphasis on �eco-warriors� and the spiritual quest, it feels more than a little full of itself. Yeah, the original sported some of that emphasis as well, but it didn�t seem quite as infatuated with its own self-righteousness. The 2015 Break also comes utterly devoid of the originals spirit. Again, I won�t make out the 1991 film to be any sort of classic, but it did muster reasonable vivacity and verve. The remake lacks any of the same goofy elan, as it seems overly somber and self-serious. Granted, I should probably appreciate the filmmakers� efforts to deviate from the prior film�s template. It focuses on the same bones as the 1991 flick but creates enough differences to let it exist as its own entity. Unfortunately, the results fail to intrigue or entertain. Again, that sense of self-seriousness becomes oppressive, which means we never find ourselves involved in the proceedings. We follow Utah, Bodhi and the others on their adventures but don�t invest in any of these. It doesn�t help that the stunts/action scenes seem strangely lifeless. Some of these elements boast real potential to dazzke, but they come across as oddly flat. Intellectually, I recognize the thrills on display, but emotionally, these scenes don�t connect, so no excitement ensues. The characters remain flat and turgid, and the actors fail to bring any personality to them. They stick with that overly sober, dramatic sensibility that ensures the roles remain dull. It�s hard to feel tension when you don�t care of characters live or die. The participants seem so morose and anonymous that no emotion results. Break also seems to forget to include a plot. Isn�t Utah supposed to be an FBI agent on the trail of criminals? You�ll be forgiven if you forget that narrative arc, as the filmmakers ignore it to an enormous degree. Instead, we find endless scenes in which the characters look serious and spout New Age nonsense about enlightenment and whatnot. Point Break suffers from its inability to figure out what to do with its source material. That means it ends up as boring and ponderous without an ounce of excitement on display. Point Break appears in an aspect ratio of approximately 2.40:1 on this Blu-ray Disc. Across the board, this was an accurate transfer. Sharpness always looked strong. No signs of softness marred the presentation, as it gave us a tight, well-defined image. Jagged edges and moir� effects remained absent, while edge haloes also failed to appear. Print flaws stayed absent as well. Like most modern films of this sort, Point Break went mainly with teal and orange � especially teal, as the image showed a heavy green-ish orientation. These tones seemed predictable, but they worked fine within the movie�s design parameters and showed good delineation. Blacks were dark and tight, while shadows usually showed nice clarity and smoothness; a few scenes were a bit dense, but those weren�t an issue. I felt this was a consistently strong image. I also felt pleased with the film�s DTS-HD MA 7.1 soundtrack. With a fair amount of action on display, the mix used the channels in an involving manner throughout the majority of the film. This meant stunts like surfing and motocross zoomed all around the room, and the elements connected in a concise, smooth manner. Add to that music as a bold partner and the soundscape turned into an aggressive experience. Audio quality always satisfied. Music was dynamic and full, and effects followed suit; those components came across as accurate and well-developed. Speech seemed distinctive and crisp, without edginess or other issues. Everything impressed in this strong soundtrack. Four brief featurettes appear. We get �Rock Climbing� (1:52), �Wingsuit Flying� (2:16), �Snowboarding� (1:58) and �Motocross� (1:55). Across these, we hear from director Ericson Core, free climbing technical advisor Chris Sharma, wingsuit camera flyer James Boole, wingsuit pilot Jon Devore, technical advisor Jeb Corliss, extreme snowboarders/stunt doubles Ralph Backstrom, Lucas DeBari, Mike Basich and Xavier de le Rule, 2nd unit director Rob Bruce, motocross rider Steve Haughelstine, and actors Edgar Ramirez, Matias Varela, and Luke Bracey. These tell us a little about the movie�s stunts, but they mostly act as bland promotional fare. We also get four Deleted Scenes. With a total running time of eight minutes, 17 seconds, we see �Airport� (0:50), �Utah Skateboards� (2:20), �Utah and Pappas at the Train Station� (2:41) and �Moto X� (2:26). These add a little character material, especially for the underused Pappas role. We also get a little coda for Utah. None of these scenes seem memorable; even the expansion of Pappas fails to offer much substance. The disc opens with an ad for Batman v. Superman: Dawn of Justice. 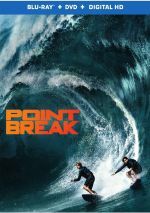 We also locate two trailers for Point Break. A third disc provides a DVD Copy of the film. It includes the deleted scenes but lacks the featurettes. Stiff and lifeless, Point Break cares more about its cartoonish view of ecology than with cinematic entertainment. The film plods without any sense of drama or excitement on display. The Blu-ray boasts excellent picture and audio but it skimps on supplements. Stick with the 1991 Point Break, as the leaden remake flops.